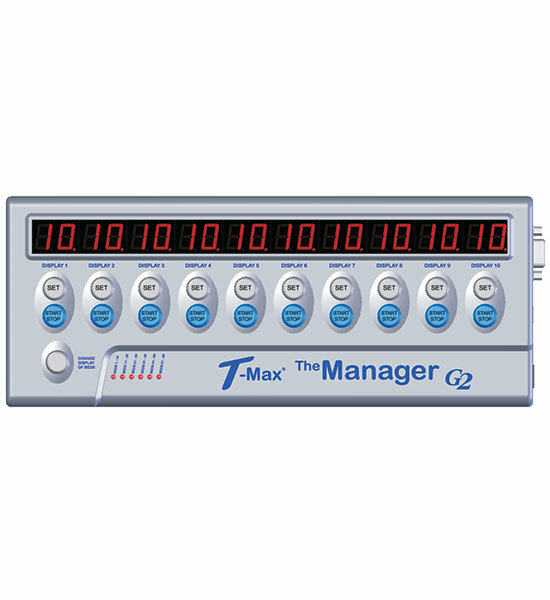 The T-Max® Manager G2™ is a front desk control unit for the T-Max® timers. It can be connected to up to 60 T-Max® 3W/G2s to control up to 60 tanning units in a single salon. It also works with tanning beds with T-Max® Certified Timers installed in them. The display consists of 10, two-digit LED displays along the top of the T-Max® Manager G2™ with a Start/Stop and Set button below each display for manual control. A Horizontal row of 6 LEDs indicates which bank of ten beds are being displayed. The T-Max® Manager G2™ can be used manually or be controlled with a PC using today's most popular tanning software. Up to eight T-Max® Manager G2s™ and/or T-Max® Manager/Pros can be connected in a single salon. 20, 7 Segment LED displays showing times and status' of 10 units..
6 LEDs shows which banks of tanning units are being displayed, 1-10, 11-20, etc..